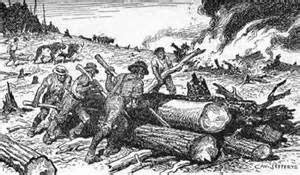 As a student of my state’s history, I’ve learned that the life of an Indiana pioneer two hundred years ago was not easy. 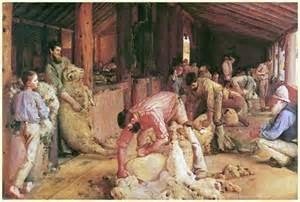 Just to stay fed, clothed, and relatively safe required back-breaking work from sunup until sundown. Many of the pioneers’ more arduous chores required multiple hands to execute, providing opportunities for these early Hoosier settlers to come together and turn the work into fun, social occasions. Indiana pioneers, like many others over North America, grabbed with both fists these opportunities to break up the monotony of their daily lives. 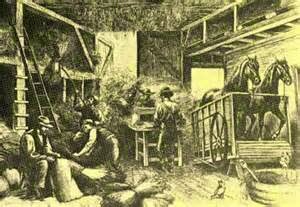 Examples of such events could be found throughout the year in Hoosier frontier settlements. 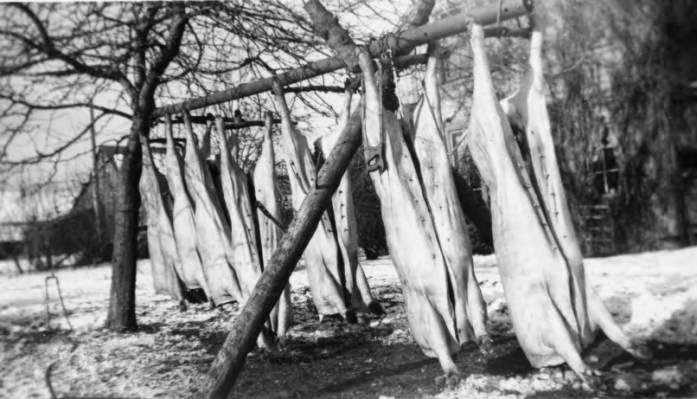 During the winter there were butcherings, where the community came together to help process the pork and beef supplies for the year. 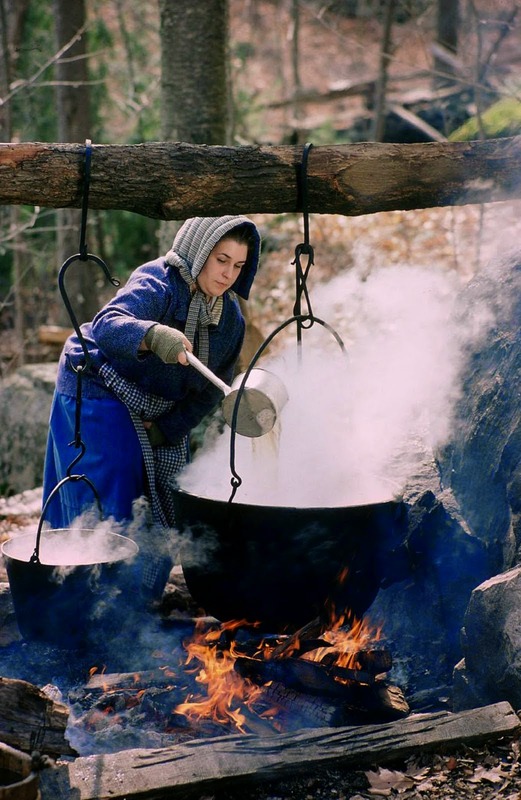 In the spring there were sheep shearings, sugar boilings; when the sap of the sugar maple trees was collected to make syrup, and log rollings to clear cut timber from land to make room for a cabin or farmland. 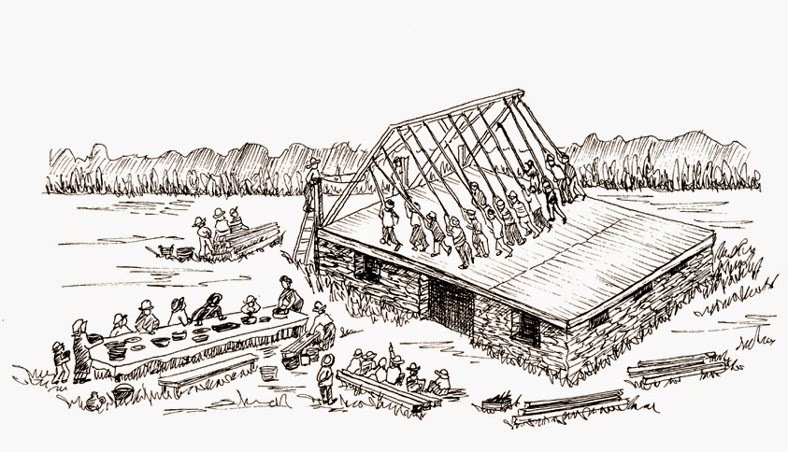 ﻿The summer ushered in the season for quilting bees, weddings, wheat threshings, and cabin and barn raisings. 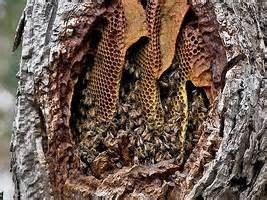 The autumn brought even more opportunities for work-parties beginning in September with bee hunts, where parties would venture out into the woods in search of hollow “bee trees” full of honey to harvest. 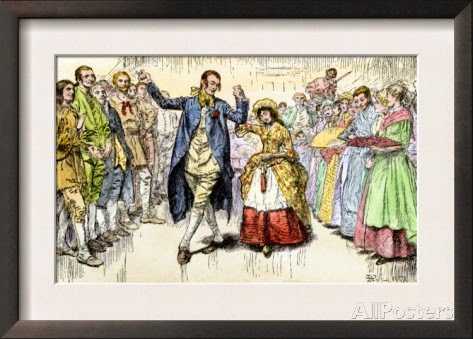 Most often, these work-party events involved contests and were fashioned in a way as to encourage young people of marriageable age to mingle and hopefully for love to bloom. Two such examples held in the fall of the year were apple parings and corn huskings. The object of an apple paring was to prepare apples for drying; a method of preserving the fruit for use until the next apple harvest. Apples were peeled, quartered and cored, then strung on strings by passing a darning needle through the center of each apple quarter. Workers divided into teams, and the winning team was the one that finished the task quickest and most efficiently. During the paring, any girl who happened to get a hollow-cored apple was compelled to kiss a young man of the opposite team. In another game, girls would try to peel an apple with the paring in one long string. They would then throw the length of paring onto the floor. Whatever letter the paring resembled when it landed was thought to be the initial of her future husband’s name. lady as a partner for the contest. 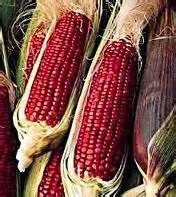 During the husking, if a lady happened to find a red ear of corn she was entitled to a kiss from each gentleman present. If a man found a red ear, he got a kiss from every woman present. 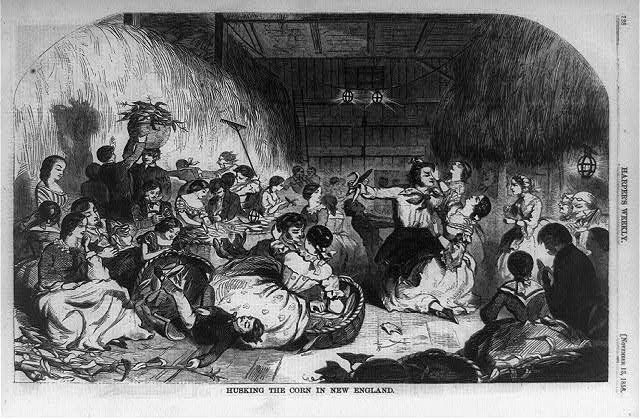 Apple parings and corn huskings, like nearly all of these pioneer work parties, ended with a supper and a dance. 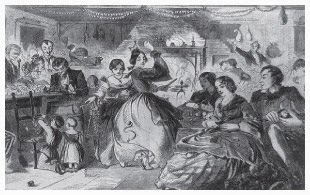 Many of these social get-togethers were still prevalent in rural Indiana communities well into the twentieth century. My own grandparents met at a log rolling a little over a hundred years ago. 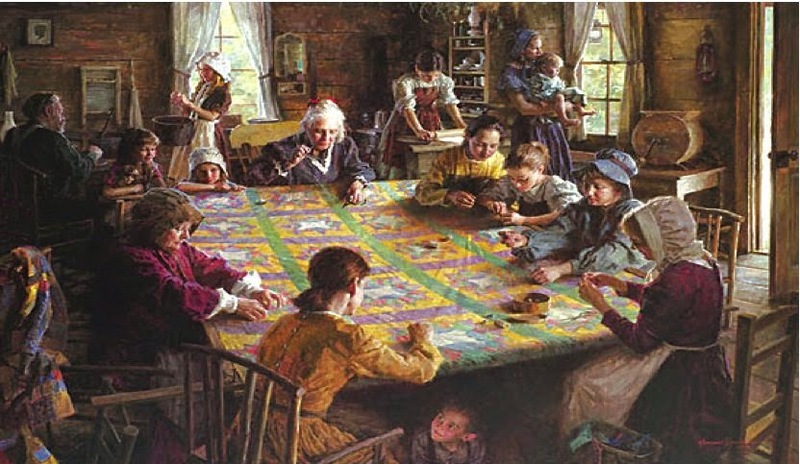 Do you have a family story associated to one of these pioneer work-party social gatherings? I’d love to hear it! Ramona Cecil is a wife, mother, grandmother, freelance poet, and award-winning inspirational romance writer with eight published novels and novellas to her credit. Now empty nesters, she and her husband make their home in southern Indiana. A proud Hoosier, Ramona likes to set her stories in her home state. 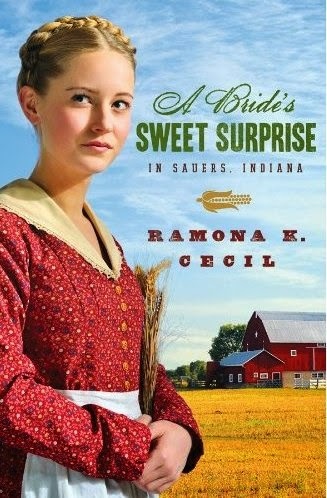 Visit her website at www.ramonakcecil.com to check out her latest books. 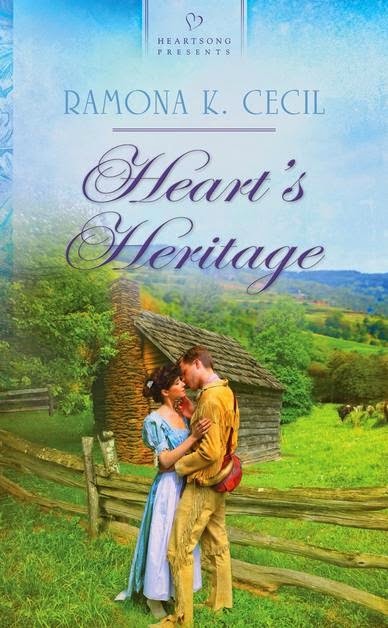 I don't have a family story associated with any of these traditions, but I love books set in this time period. I think the most successful families are those who are able to make work fun. Thanks, Connie! Even the hardest tasks can be made fun when families and neighbors work together, especially if there is a contest involved. :) Thanks for stopping by! I personally don't know of anyone who held the traditions mentioned but I thoroughly enjoyed your blog posting today. I love history!